One of the many joys of having an artisan baker as a friend is that she finds little bakery gems and invites me along to test them out. 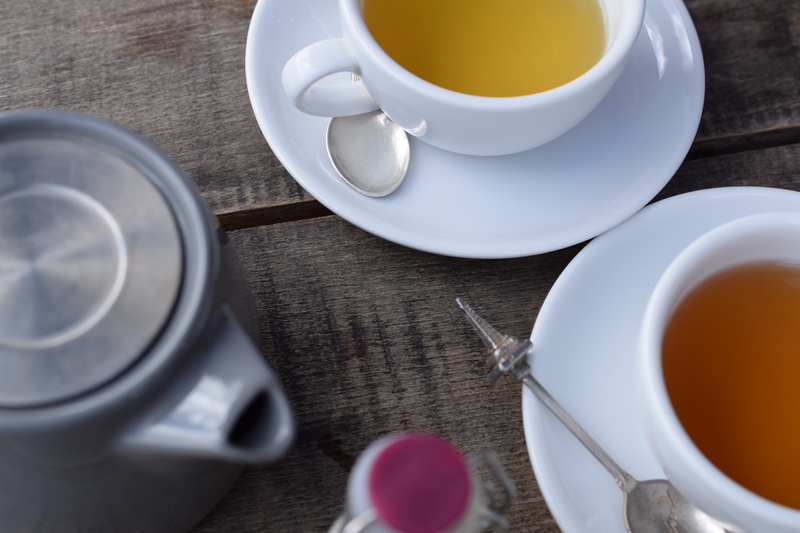 Purely market research you understand as we would not normally like to spend our days off chit chatting over cups of tea and enjoying freshly baked produce!……. It’s a tough life. This week we discovered Flourish, a craft baker tucked away on an industrial estate in Watford. As the sat nav led us past tyre fitters and wholesalers I began to think we were in the wrong place (I don’t trust sat nav’s at the best of times) but then it emerged before us. In contrast to it’s run down industrial surroundings Flourish stands proud with grey painted brickwork and slick black signage; a clean and sleek oasis. The building is huge with the bakery taking up the majority of it, they need the space as they supply several high end hotels in London as well as The Grove locally. Sitting proudly at the front is the cafe with rustic, warm decor of reclaimed wood panelling and worn leather seats, welcoming you in to the comfortable, relaxed atmosphere. Vintage pastry trays and pans line the walls while wooden crates display goods for sale, simple yet elegant. Above each table a low hanging pendant light keeping an intimate feel and your focus on the food before you. The wood panelling is punctured with bright windows of white light showing you the inner workings of the bakery. Machines whirring and hands kneading, just a pane of glass between the creators and the client. The breakfast and brunch menu is simply mouth watering, there are no greasy spoons here! Fresh, vibrant ingredients lovingly put together to satisfy your hunger, the difficulty is deciding what to have. Having tried and failed to cook the perfect poached egg more times that I care to admit I now leave this nemesis of mine to the experts. Clearly these guys knew what they were doing so I ordered the smashed avocado and poached eggs with halloumi, on sourdough. I had prepared myself for the menu choices and I knew the selection of breads and bakes would be varied. I had not, however, expected there to be such an interesting tea selection. The brand stocked is Birchall’s, an eco-concious London tea company who have developed plantations around the world. They work closely with the communities they’re in, are rain forest alliance certified and fair trade. Amongst the more familiar blends I noticed one on the menu I had not heard of before, Virunga….I was intrigued. Virunga tea is grown at high altitude in Rwanda, close to the Democratic Republic of Congo in the Virunga National Park. Not only does this park nurture exquisite tea plantations it is also home to endangered wildlife such as Mountain Gorillas. You can read more about Birchalls conservation work at their website where they also recommend a Netflix documentary called “Virunga” for an insight into the area. One for the watchlist me thinks. Large companies have such an obligation to the nations they work with, amazing produce can be grown whilst still caring for the environment and local communities. In the bag Virunga is a fine black tea and in the cup it brews a warm russet colour. I found it a little strong to drink without milk – as my friend described it “It’s very Tea-ee”! I would have to agree. A strong and earnest brew it will appeal to those who like a “proper cuppa”. Slightly more refined around the edges that a builders brew but still packs a punch. Virunga also comes in earl grey and Chai blends which may be softer on the palate but I am yet to try. Brunch was nothing short of eggy perfection. The sourdough, toasted but still soft, had a delicious chewy crust, slathered with creamy, smashed avocado. The halloumi was pleasingly squeaky (I expect nothing less from squeaky cheese!) and not as salty as many supermarket brands. As I popped each egg the golden yolk flowed dressing the plate with sunshine. A gentle sprinkle of chilli & chives graced each fork full providing just a tingle of warmth. My plate was cleared and my tummy was full. So full I had to get my sweet treat to take away! The counter had plenty on offer, from huge slabs of carrot cake to delicate fruit tarts. It’s not often I go for a chocolate choice but I was enticed by the coconut brownie. A good few hours later that afternoon as the 4pm slump hit and the kettle was on I tucked in. Not as gooey as some brownies but I don’t think thats a bad thing. Sturdy enough to hold and bite in to, the desiccated coconut adding both texture and flavour to the bitter sweet chocolate. Deliciously satisfying and definitely worth the wait! The vibe of Flourish is very much of an artisan bakery but their wealth of experience and expertise comes across in droves. There is little reason to visit this North Watford industrial estate but for the delicious food, welcoming service and artisan loaves that entice people back time and again. I doubt you’ll be passing but I highly recommend a detour. 5) In at 5 is an after dinner favourite Fresh Mint Tea. Great to settle a full tummy and can be enjoyed hot or cold. There are plenty of mint tea bags on the market but there is nothing wrong with simply grabbing some fresh mint from the garden and plunging it into boiling water. 4) Warming your cockles at number 4 is Chilli Rooibos. This is blend I found at Kanuka tea house and although it’s an acquired taste it soon becomes addictive. With dried chillis and rose buds in the mix it has floral notes with a sting in the tale. It can be like tea roulette as each cup can vary in spice levels depending how much chilli you scoop up. Great for the metabolism and Rooibos has suburb health benefits as well as being caffeine free! Give it a try if you’re feeling fiery. 3) Bringing balance at number 3 is Oolong. I have recently discovered how wonderful this tea is for both it’s flavour and it’s healing properties. It’s a beautiful tea to look at, tiny rolled pearls which unfurl in hot water to reveal their natural green leaves. This tea fills the gap between green and black teas so carries many of the properties of both. Don’t be put of by it’s earthy fragrance as it is much lighter on the palette than you’d expect. If you can’t quite handle the bitter quality of green tea but want the same antioxidant power then give Oolong a try. 2) A classy cup of Afternoon Tea is number 2 on my list. Most tea houses will offer an afternoon blend on their menu and the exact blend of leaves will vary from brand to brand. I enjoy a blend from Tealicious which is a subtle blend of Assam & Ceylon. The brew is light and creamy so I find no requirement to add milk but you can to taste. It’s a perfect cup for a summers afternoon with a slice of something sweet. I find this blend satisfying and reliable so it’s worth having in the cupboard for when you feel like adding a little sophistication to your day. 1) So top of the teas is the beautiful and tasty Genmaicha, a Japanese breakfast green tea blend. I recently found this little gem at The Camden Tea Shop in London. This is green tea blended with popped rice which gives a toasted warmth to the brew. It looks so pretty, speckled with popcorn and rice grains, and although you can taste the green tea the rice adds a depth of flavour that eliminates any bitterness from the leaves. It’s currently my favourite way to start the day and I highly recommend it for a breakfast cuppa with a difference. Thank you for reading and happy brewing! For any tea enthusiast China is a dream destination where days can be spent getting lost in tea plantations and tasting all the amazing brews on offer…..I can but dream! However my Aunty & Uncle were recently lucky enough to travel around parts of China and kindly brought back two types of tea for me to try. This is a black tea which originates from the Yunnan province of China. After a complex process of fermentation the matured leaves are pressed into cakes for storage and sale. These can range from 50g to 1000g in size, shaped into bricks, balls or domes. My gorgeous gift tin is filled with individually wrapped mini cakes, the golden foil more familiarly associated with sweets and chocolate rather than our daily cuppa. Just half a cake is required per brew and this can be reused 7 or 8 times. You don’t get that sort of value with your standard supermarket bag! The cakes are sturdy little things but with a snap in the middle I pop half in the pot to make my first cup. The dried leaves have a strong peaty aroma which is released when dowsed in the boiling water. This is a grounding brew, powerful and earthy it’s not messing about. I fill my cup with the stunning russet liquid, like the embers of a camp fire smouldering away. Thankfully not as ferocious on the palate as you may expect. It’s strength is contained in the fragrance which gently washes over your tongue to leave a smoky after taste. Cleansing and moreish I enjoyed this brew, not least for the health benefits it boasts; assisting weight loss, reducing blood pressure and cholesterol. Oolong is distinctive by it’s small, smooth pellet form. The leaves are worked through a process of bruising, withering and shaping to reach the desired texture. Falling between the gap of black and green teas, Oolong is the middle ground where many of the health benefits of green tea are present but the flavour is milder thanks to the longer oxidation period. These leaves can also be reused, with the 3rd or 4th cup being rumoured to be the best flavour. It’s hard to believe the tiny green pearls are tea leaves but as they begin to steep the hot water entices them to unfurl and release their flavour. This brew shines golden orange in the cup with a sweet honey suckle fragrance. It’s feels light and summery on the palate making it very easy to drink. The smooth, sweetness of honey is kissed with a subtle after thought of liquorice from the ginseng. No matter the weather outside the sunshines on you as you enjoy this brew. I was aware that Oolong was readily available here in the UK but I am pleased to find that Pu’er (aka Pu’erh) is also available from most good stockists in either loose leaf or cake form. So next time you stick the kettle on why not try and taste of the orient and enjoy a little ceremony with your tea. Last weekend I was invited to Afternoon Tea to celebrate the 60th Birthday of my partners Mum. Having been to a few venues for tea and cake I was delighted to find out this would be a home made family affair. Happy to chip in I enlisted the help of my best friend, and master baker to make the staple of any afternoon tea – Scones! I was a mere sous chef so I can’t take credit for the baked goods which wowed the guests. Golden brown on top with a light crumbly centre. Dowsed with a healthy (or should I say unhealthy) dollop of clotted cream and jam. Just delicious! The spread was impressive with many of the treats gluten free to cater for my partners sister. I find home made gluten free treats so much tastier than shop brought for some reason. Mini cup cakes of various flavours, canapés and rocky road all made for a satisfying afternoon of grazing. The whole set up was brought to life with a fantastic array of vintage crockery, mismatched in every colour and pattern with cake stands and serving dishes too. They came from a local company called Vintage Rose China and really completed the whole event. Friends and family came together, sharing stories over sandwiches. The table a feast for the eyes with each tasty morsel a treat for the tastebuds. Turning another year older can make us all feel as delicate as china but when you are surrounded by those who care you realise that age is but a number…….and a fantastic excuse for cake! It has taken me a little while to publish this blog, not though lack of trying, just that it needed my full attention. Now the festive season has passed I had a weekend to myself so I was able to do it justice, or so I hope! I was introduced to a company called Tealicious through a colleague at work. On hearing about my blog she recommended I tried some of the products they offer. The fact there was a Hertfordshire based loose tea company intrigued me and after checking out their website I ordered myself a few taster tins; Royal Reserve, Afternoon Tea & Rwanda Green. Shortly after my order confirmation email I was sent a follow up advising me that the Rwanda Green was not available, a real disappointment as I am always in search of a Green Tea I find easy to drink. Thankfully they had offered to replace this with a Green Tea from the Yunnan region of China and for the inconvenience they added a Darjeeling taster tin as well!! What fabulous customer service!! Let’s start with the freebie. I am so glad Tealicious sent this to me as I have never tried it and for some reason shy away from it in favour of more familiar teas. This is known as the Queen of Teas and certainly has the presence of royalty. The temperature, altitude and soil all playing their part in nurturing this earthy brew and give it real substance. Tealicious recommend a 3 minute brew time which I found to be sufficient, much longer and it becomes too astringent. The leaves smell of dry autumn leaves and hay bales, strong and peaty. The water turns golden as it brews and the scent becomes much lighter and fresher. You can add milk if you wish but I enjoyed it without. The earthy flavour lingers in the aftertaste but I didn’t find it over powering. Warm and comforting this is a sturdy brew grounded in its Himalayan routes. If, like me, you find Darjeeling a little intimidating then I recommend you try this regal blend. The earthy Darjeeling is blended with malty Assam which softens it enough for new comers but doesn’t sacrifice any of its depth. Brew for 4 minutes, as recommended by Tealicious, or perhaps a touch less if you’re new to these flavours. The brew has warm, inviting russet tones with a light scent. The Assam brings a smokey background which lingers after each sip. You are welcome to add a splash of milk which does make it a little smoother on the pallet but I found it unnecessary as well as making it less appealing to the eye. A well balanced, smoky brew, strong enough to accompany any afternoon tea. This a beautifully light combination of Ceylon & Assam, not smoky like the Royal Reserve as the light touch of malt shines through. Light and golden it is as refreshing to the eyes as it is to the pallet, very easy to drink. I found it had an almost creamy quality even without milk, although you can add a drop if you fancy. The grassy citrus from the Ceylon finishes each mouthful on a refreshing note. A very balanced brew which I could drink at any time of day. So this was my replacement blend and my first venture into loose green tea. I have to say all the bags I buy leave me with such an astringent taste in my mouth I end up drinking green tea as you would take medication as a child; grin and bare it as the benefits should out weigh the negative taste! I am pleased to say this brew did not leave such a bitter taste in my mouth. Tealicious recommend a 3-4 minute brew and ideally let the water cool just a touch before pouring it onto the leaves to bring out the best flavour. This brew has a golden green glow, far more appetising than the pond water effect you get from most bags! Smoky background notes warm the pallet with a balanced astringency you associate with green tea but no bitterness at all. Each brew has it’s own personality and I enjoyed each in its own way. If I had to pick a favourite it would be the Afternoon Blend as it was so light and moreish, very drinkable for all pallets. The others may be preferred by more adventurous tea drinkers but the taster tins are perfect for trying something new for a very reasonable price. Whether you are an tea fanatic or you just enjoy a simple brew I urge you to check out Tealicious. Their blends are non fussy and reasonably priced, each with expert advice on where it’s grown and how to brew it. You can order on line or, if you are local, visit one of their stockists in Hertfordshire and London. I love the simplicity of this company and I mean that as a compliment. It’s clear that thought and compassion goes into each blend selection, high quality, hand selected and accessible – everything you could ask for in a decent cup of tea. Happy Brewing! With the stunning colours of Autumn in full bloom a friend and I decided we must take this opportunity to head out with our cameras. The season disappears so swiftly and I couldn’t bare the thought of not spending some time amongst nature to capture this beautiful time of year. Wrapped up warm with batteries charged we drove out to Ashridge Forest, part of a National Trust Heritage Estate. I have been visiting this place my whole life; as a child I’d climb trees and collect conkers, on school field trips we analysed soil samples and pond water, and now I walk the dog and enjoy photography in the fresh air. I remember as a child my family often dragged us out on walks before or after a Sunday roast to “blow away the cobwebs” or “work up an appetite”. This concept was lost on me back then but now, even when the weather is cold, I often feel the desire to get outside and stretch my legs. Luckily the weather was dry, unluckily we did not account for the fact it was half term! We headed off the beaten track to avoid the hoards and take some shots. I uncovered a new interest in mushrooms and found more obscure ones to take photos of. I love the way looking through a lens can change your perception of a subject. There is a lovely cafe at Ashridge Monument which we had planned to visit, on arrival the queue was out of the gate and the garden swamped with kids fuelled by cake and stressed looking parents fuelled by caffeine! Not wanting to counteract the peace and quite we had enjoyed amongst the trees we escaped Ashridge and headed to a place my partner in cake had recently discovered. It seems this hidden gem is advertised by word of mouth. I grew up just a 10 minute drive from Little Heath Farm and I had no idea it existed. My friend found it through a friend, who found it through a friend, who found it through a…….you get the picture! Tucked away down a country lane lined with impressive detached houses it’s not the sort of place you would stumble across. Having been in business for over 40 years they are clearly doing a lot right. Turning into the very tight entrance it was clear the parking was not for the faint hearted. The narrow gateway leads you down an overgrown track and into the small car park. With no obvious flow to the traffic there was some mild chaos as a lady was trying to leave through the same gate we were entering! All good fun! (I can say that as it was not me who had to reverse!). The Nursery feels very casual in comparison to the large chain garden centres you and I are probably more familiar with. I feel my lack of horticultural knowledge would have found me lost and confused amongst the rows of unlabelled plant life so if you are going to buy I’d take guide. A beautiful pergola draped in vines took centre stage, tucked underneath in their winter storage were tables and chairs, eagerly awaiting the warmer months. With my fingers more blue than green we headed into the wooden clad Sanuk shop and cafe to warm up. Sanuk is a real treasure trove of items from around the globe. Large ornate mirrors reflect light from low hung chandeliers, illuminating hand carved wooden animals, decorated bowls and trinkets. You have to cut through the small on site kitchen into the light, bright, dining room, all the baking is done off site and just warmed up and presented in the cafe. A familiar vintage affair greats you, with mismatched furniture and grand dressers displaying the goodies on offer. I am advised that there used to be vines from the garden growing through the roof and coiling themselves around the exposed oak beams. After a recent face lift these have all been cut away (somewhat of a shame but possibly healthier for the structure), white washed walls display artwork for sale. The focal point of the room is an exposed brick chimney breast and log burner, all that was missing was a dog curled up at the hearth. There seemed to be a limited amount of cake on offer, possibly as it was late in the day, and after hearing apologies at the next table for the crumbly texture of the chocolate cake I, perhaps controversially, decided to go savoury. The menu listed a warm cheese scone with butter which, on a chilly day, seemed the perfect option. I perused their eclectic tea cabinet which contained a wide variety of tea bags, from Twinings to Waitrose and everything in between. It was a little like rummaging in a friends kitchen cupboard in the hope something takes your fancy. In my mission to combat the chill in the air I opted for the warming spice of Masala Chai. My partner in cake braved the crumbly chocolate cake and had a (much needed) glass of homemade elderflower cordial to wash it down. The staff seemed a little distracted and took a while to take our order, not that we were in a rush, but thankfully the food didn’t take long to arrive. Our order was served on quaint, mismatched crockery and a teapot reminiscent of Aladdin and his lamp. The giant wedge of scone laid before me surpassed all expectations. It had a relatively dense texture but was rich with cheesy flavours. I was grateful for a decent helping of butter to accompany it, I always feel a little embarrassed asking for seconds! The salty, creamy butter melted into the golden scone and gave me a big cheesy hug as I devoured every last morsel. The first cup of my Chai was delicious, warm yet refreshing. Unfortunately with it being a tea bag in a tea pot it started to over brew and as I refilled the dainty cup the flavour became too strong and slightly bitter. The afternoon soon disappeared amidst photography talk and ideas for our next adventure. It was such a pleasure to be introduced to this secret garden and the homely little cafe within. The joy will be returning as the seasons change to explore what is in bloom and discover what homemade treats are on offer.